Penelope Kite stood at the door of her dream home and wiped her brow with the back of her hand. The late morning heat had brought the air to a steamy simmer. August was a hot flash that never subsided. Uncut grass stood waist high in the courtyard, and a thousand cicadas sawed their jittery music. Every so often a large wasp built like a military helicopter would break away from the swarm around the fig tree and enter the kitchen in a show of menace. She slapped a broken fly swat down onto the thick layer of dust that coated every surface, and missed yet again. The stone-flagged kitchen floor offered no reply. She sat down on a rickety wooden chair. It creaked ominously. She was definitely going to have to cut back on croissants. "What 'have' I done?" she wailed to the walls. Well, you polished off a whole bottle of cheap rose last night, they seemed to say. That wasn't clever. She had a sinking feeling that she had taken on more than she could chew in this crumbling wreck of a place, and there was no one to blame but herself. In the days and weeks afterwards, as she went over and over these crucial hours until they seemed unreal, she would look back on her hot and headachy panic in the kitchen and think that it was nothing compared to what was about to break. But Penelope was sure of one thing: she had not left the house to brave the searing brightness of the garden until a couple of hours later. So she could not possibly have known what was floating facedown in the swimming pool. In early spring, everything had been so different. Penelope had been energized by the cloudless blue skies of the South of France. Following a particularly gruesome family Christmas with her two children and their badly behaved families, she had escaped an Easter that promised more of the same but with added chocolate. Two wonderfully tranquil weeks in April had left her yearning to stay longer. The Côte d'Azur had long since become Wimbledon-sur-Mer, but the Luberon Valley was charming. Penelope had visited this area of Provence many times during the course of her marriage and had always been able to relax in its sunny friendliness, even when her husband was as distant as the top of the long rippled ridge of mountain that hung like a blue curtain behind the ancient hilltop villages. Churches and crumbling fortresses and narrow streets had the slumbering feel of the warm south, and the orchards and vineyards below promised a land of plenty. The pace of life seemed more relaxed, less full of braying expats, especially English ones from the Home Counties. By the end of the first week, she had begun to indulge in some delicious daydreams and succumbed to perusing photographs of houses for sale in the estate agency windows. 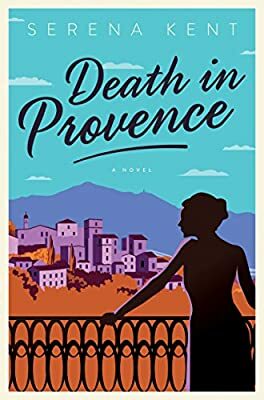 A few days later, after a particularly refreshing carafe of rose with lunch, she found herself entering the door of an agency in the pretty village of Menerbes. The woman behind the desk nodded as Penelope waited for her to conclude her telephone conversation in leisurely fashion. She was the very epitome of an elegant Parisienne in her forties. Her blond hair bounced in all the right places to flatter a beautifully made-up face that no doubt benefited from all the mysteriously effective processes of French dermatology. The tiny navy-blue jacket, nipped in at the waist, looked like real Chanel, too. She made Penelope feel enormous, and very badly dressed. Finally, she replaced the receiver with a flick of the wrist that set the charms on her large gilt bracelet jangling, and assessed her prospective client. It was the kind of look engineered to deter time-wasters. There must be plenty of them about. Penelope hoisted her best smile. "Bonjour, madame." "Bonjour. Comment je peux vous aider?" A lovely stone house, Penelope told her in faltering French, that was what she was looking for. On a hillside, with a view and a garden—but not too much land. Three bedrooms and two bathrooms. A swimming pool, or space to build one. Goodness, thought Penelope. Those daydreams were awfully specific. "I have several properties that might interest you," said the Frenchwoman in perfect English. Penelope didn't know whether to be relieved or annoyed. "Ah, good," she said.